Blacksburg, Va., June 1, 2016 – Students interested in the field of transportation will have a unique opportunity to interact first-hand with industry researchers and professionals during the inaugural Women in Transportation Seminar – The Future of Transportation, Aug. 31 – Sept. 1 at the Inn at Virginia Tech and Skelton Conference Center, Blacksburg, Va. 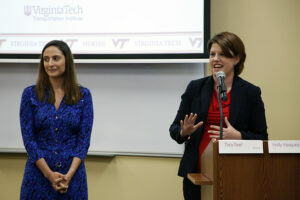 The seminar will be hosted by the recently ratified Virginia Tech student chapter of the Women’s Transportation Seminar and will feature a poster dash workshop and presentations, panel discussions, speaker seminars, and a speed mentoring session. Keynote presentations will be made by Deborah Hersman, president and chief executive officer of the National Safety Council; and Ann Brach, director of the Technical Activities Division of the Transportation Research Board, a division of the National Academy of Sciences. Hersman’s keynote address will focus on “Five Leadership Lessons – How You Learn from Crashes, Collapses and Chaos.” She is a recognized leader in safety and helps further the National Safety Council goal of “making our world safer” to improve every workplace, home, and community, as well as the way citizens travel every day. Prior to joining the council, Hersman served as chairman of the National Transportation Safety Board. Brach will be discussing “Doing Great Things: Myths, Partial Truths, and What It Really Takes” during the seminar. In her current role, she has overall responsibility for the Technical Activities Division in support of an array of federal, state, local, and private-sector sponsors. These activities include the Transportation Research Board Annual Meeting, conferences and workshops, a peer-reviewed journal, and other products and services that advance the knowledge and practice of transportation. Brach previously served as director of the Second Strategic Highway Research Program at the Transportation Research Board. During the seminar, a poster dash workshop will be held during which selected student posters will be presented briefly in a roundtable setting. Student presenters will then be able to initiate a discussion about their topic of interest with attendees, including the keynote speakers and expert panelists. The workshop is designed to help foster creative discussion among participants and allows for a deeper dialogue. Following the workshop, a poster presentation session will be held. Students will have another opportunity to engage with seminar panelists and keynote speakers during a mentoring session on Sept. 1. The session is designed to be an engaging, fast-paced event, wherein students have the opportunity to have brief, directed, mentoring sessions with keynote speakers, panelists, and industry professionals. Student poster abstracts may be submitted until June 17. Examples of abstract topics can include transportation safety, infrastructure sustainability, advanced vehicle systems, human factors, and urban planning and policy. As an inclusive organization, the Women’s Transportation Seminar welcomes all students—both Virginia Tech and non-Virginia Tech students of all genders—to attend the seminar and submit poster abstracts. More information about abstract submission, as well as student and professional registration, may be found on the Women in Transportation Seminar website. The seminar is being held as part of the Fifth International Symposium on Naturalistic Driving Research, which will be held Aug. 30 – 31 at the Inn at Virginia Tech and Skelton Conference Center. The naturalistic driving symposium will provide researchers and practitioners with an overview of international naturalistic driving studies and insight into the future of such research. Attendees will also have the opportunity to interact with panelists to discuss naturalistic driving in their respective countries. Symposium keynote speakers are Ron Medford, safety director for the Google Self-Driving Car team; and Bruce Simons-Morton, associate director for prevention and senior investigator in the Division of Intramural Population Health Research at the National Institute of Child Health and Human Development. Registration and event information for the Fifth International Symposium on Naturalistic Driving Research may be found on the event website; a limited number of student registrations are available, though students do not have to attend the symposium to participate in the Women in Transportation Seminar. The lab of Bryan Brown has become a hub for young researchers – summer undergraduate researchers in particular. Since 2013, Brown’s work on Southern Appalachian crayfish has helped several undergraduates gain advanced research experience as part of the Fralin Life Science Institute’s Summer Undergraduate Research Fellowship program. Brown, an assistant professor of biological sciences in the College of Science, studies community ecology, and one ecological system in particular: the relationship between crayfish and their worms. These aquatic worms, known as branchiodellidans, eat the biofilm and sediments that accumulate on crayfish bodies. In exchange, the worms live on the crayfish in a systemic relationship commonly known in biological research as a symbiosis – a bond in which both species mutually benefit. Recently, several summers of hard work culminated in a paper co-authored by former Fralin fellows Samuel Doak and Meredith Leonard. Sam Doak (pictured left) and Meredith Leonard. Along with Brown and colleague Robert Creed of Appalachian State University, Sam and Meredith spent months – even years – performing fieldwork and analysis to further explore the crayfish-worm relationship, which serves as an effective biological model for various research fields. “We were fortunate to have these incredible undergraduates help with the research,” said James Skelton, lead author on the paper who, at the time, was a Virginia Tech doctoral student with Brown; Skelton is now a postdoctoral researcher at the University of Florida. With Sam and Meredith’s help, the team was able to observe that, among other things, when the worms are beneficial to the crayfish, they are more diverse in abundance and interact more. However, this changes as crayfish age, which shifts the relationship dynamic from parasitic to mutually beneficial. Learn more about Sam and Meredith by reading their stories here.